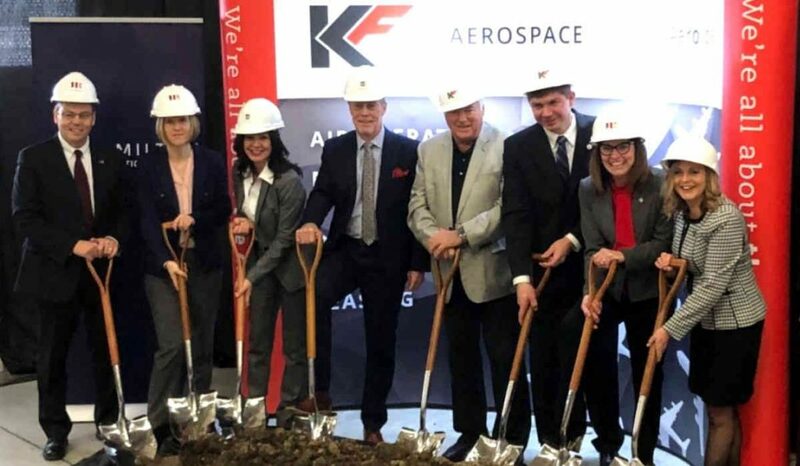 KF Aerospace today broke ground on a $30-million expansion of its aircraft maintenance, repair and overhaul facility at the John C. Munro Hamilton International Airport (YHM). The expansion will add 150,000 square feet and more than 275 new jobs. The company explains the centrepiece of the project is a new 75,000-square-foot hangar, which introduces wide-body aircraft capability and additional lines of maintenance to KF’s Hamilton operation. The project is expected to triple KF’s business in the Hamilton marketplace, expanding its ability to support international cargo and passenger airline partners. KF explains the expansion will also allow it provide state-of-the-art shops, classroom and hangar space for Mohawk College’s Aircraft Maintenance Engineer programs. “This partnership with KF Aerospace ensures our aviation students get real-life learning experiences in a modern, state-of-the-art facility,” said Mohawk College president Ron McKerlie. KF also plans to have Canadian companies lead the design, manufacture and construction of the new buildings. It has contracted firms Ledcor Construction and NA Engineering for the project; and the hangar is being pre-fabricated in Brandon, Manitoba. Construction on the wide-body hangar is expected to be complete in October 2019 and Mohawk will commence classes in its new facility in August 2020.